When approaching the restaurant, there is construction along Eglinton Avenue, but usually the sidewalks are kept clear and barrier-free. The largely tiled sidewalk to the main entrance has a slight gradient but is unobstructed. The signage for the restaurant is large and easily noticeable. The main entrance has a double-door that each measure 33 inches wide. There is no automatic door opener. Crossing a half-inch threshold, there is a wide hallway that leads you to the order counter, allowing for a 360° turning space to manoeuvre any mobility devices. The text on the overhead menu is small, but they have a similar takeout menu in the restaurant or online at www.bgood.ca. There is a second double-door entrance, with no automatic door opener, just beside the drink dispenser that leads to the lobby of the building. This entrance allows for clearance as wide as the main entrance. Emergency exists are clearly marked in front of both of the entrances. The restaurant is one level with smooth, tiled flooring and no changes in texture. On the rainy afternoon that we visited, 3 anti-skid mats leading to the counter were placed on the floor. There is also space beside the main entrance to allow for the parking of scooters or other mobility devices if needed. 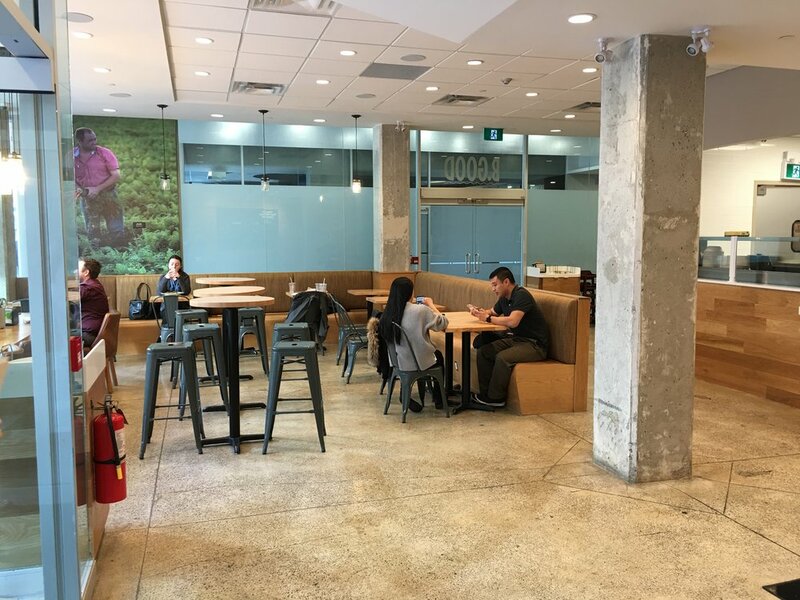 The spacious dining room features a variety of seating options: high top tables (43” high) with stools, a long table (28.5”high) with armchairs, and tables (29” high) with fixed benches and chairs. All tables, stools, and chairs are moveable. 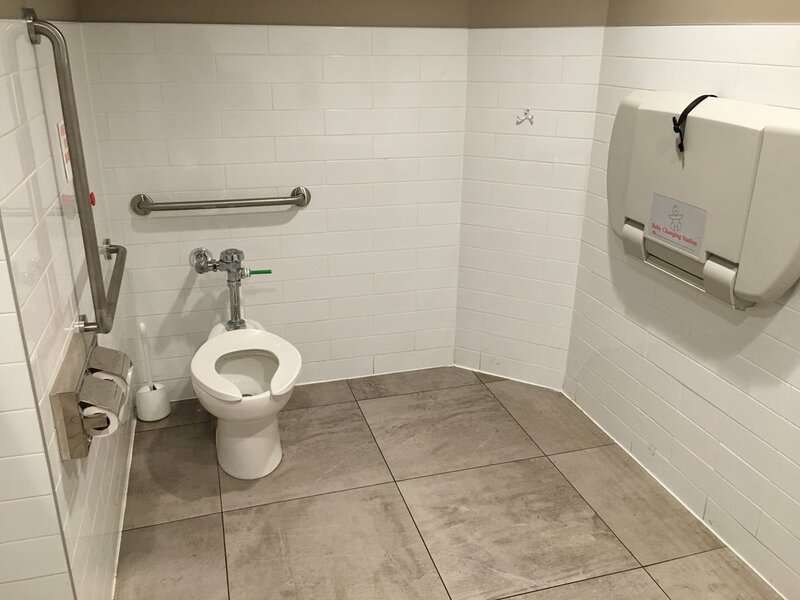 There is a large, separate accessible washroom that requires a code to access. On our visit the code was 147#. The automatic door opener works after you input the code. The doorway width is 35” and inside there is a push to lock button as well as an emergency button. The sink is 30” high with 27” of clearance underneath. There is a manual soap dispenser and automatic hand dryer, as well as paper towels. The toilet is not automatic, but the lever is on the open side (not wall side). There are two grab bars surrounding the toilet, the rear one is 35” high and the one on your right (if you are on the toilet) is 29.5” high. There is also a 36” high change table. If taking the TTC subway, B.GOOD is 3 blocks east from the accessible Yonge & Eglinton station. The #56 Leaside bus runs from the station, and stops at the corner of Eglinton Avenue and Dunfield Avenue, which is the nearest stop to B.GOOD. Alternatively, if driving, the nearest Green Parking is located at the corner of Dunfield Avenue and Eglinton Avenue. Overall, the restaurant staff were very friendly and accommodating. In fact, before we had told them what we were doing we took a quick look around the place and tried to peek into the accessible washroom. One of the staff came around the counter to see if we needed help! B.GOOD uses Ritual (order and pick up your food), or Doordash and Uber Eats for delivery. They are open everyday from 11:30-8pm if you are hungry for a light and wholesome meal or snack! Let us know what you think if visiting!